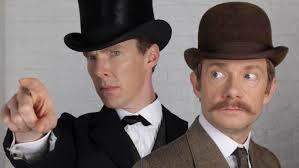 The success and appeal of Sherlock proves the adage that less is more, at least according to co-star Martin Freeman. The actor who plays John Watson, told The Independent that he is only able to keep coming back to Sherlock because of its “intermittent” nature and that if there was more he wouldn’t be as keen on it. Fans of the show usually have a two-year wait for new episodes – a fourth season will hit screens next year – however, as an added bonus there is a planned Christmas special at the end of this year. In a wide ranging interview, Freeman also talked about the difficulties shooting Sherlock on location. #Setlock has become a phenomenon that sees hundreds of fans, particularly young women, hang out at Sherlock location shoots in London as well as shoots in other parts of the U.K.
“When we’re [filming at] our stand-in for Baker Street, it is hard to do your job. And I don’t love it,” he told the Independent.